The Smark Henry RAW Report (9/4/17): #ThankYouBigShow? - Smark Henry | The voice of Filipino wrestling fans | Philippine Wrestling Revolution, WWE, and more The Smark Henry RAW Report (9/4/17): #ThankYouBigShow? The Smark Henry RAW Report (9/4/17): #ThankYouBigShow? This was one of those weeks where you forget there’s Monday Night Raw. There was nothing to look forward to coming into this episode, so it’s one of those where I just had to tune in to find out. And also because it’s my job to... There was, however, that controversial segment between John Cena and Roman Reigns last week. It was amazing the first time around because it was something fresh and different, but I’m hoping that they don’t milk it too much by repeating these sort of segments every week. It’s not special nor edgy anymore when it’s repeated over and over again! Aaaaand it’s exactly what they gave us: Cena roasting Reigns part II. It was entertaining, don’t get me wrong, but Cena getting the upper-hand on the mic again calls for Reigns winning the actual fight. It would’ve been nice to keep the score even, just so the outcome of their match at No Mercy wouldn’t seem so predictable. Hopefully next week, they’ll do something different? Cena also goes up against Jason Jordan—a reflection of his debut as a rookie against Jordan’s father, Kurt Angle, back in 2002. It was a nice touch, and comparing Jordan to Cena was a huge reminder for all of us that we need to kill the former with fire right now before it grows. Just kidding. Maybe. I actually wanted to see Jason Jordan pick up the victory, even if it was because of a Roman Reigns interference. I think the last thing Jordan needs right now is a loss, unless they’ll eventually come up with some angle around it, turning him heel with all his built up frustration… Because for now, it’s not looking too good for the General Manager’s son mostly because of his inability to keep the fans hooked on his character. If we worked better on the mic and was able to give us compelling storylines as opposed to just being bland, then Jordan would be able to get more reactions. It’s a shame, really, how he was given the most interesting storyline on RAW but just couldn’t make it work. I do like how Reigns mentioned the time it took for Cena to beat Jordan as it emphasizes on how tough of a competitor the latter can be, so it’s not completely burying him. There’s still hope! Speaking of blandness, though, I can’t even wait until the conclusion to say that this episode was so boring. Although the main event between Braun Strowman and Big Show in Steel Cage was an interesting idea, it was also pretty random. There’s nothing slower than two giants wrestling, but the Steel Cage part is what made it awesome. 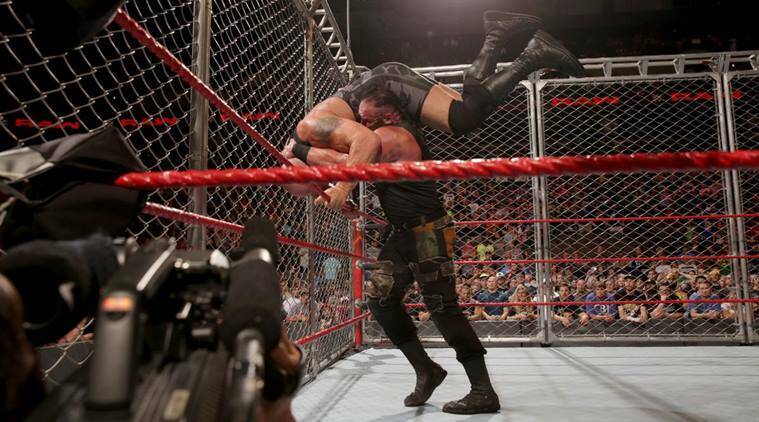 It had its moments, especially when they broke the cage in the end, and it was great way to put Strowman way over. Big Show gave it everything he got in what could be his last match before (reportedly) heading into surgery. It was like a passing of the torch. So with this, I say #ThankYouBigShow! The women pulled off a good Tag Team match, with Emma being thrown into the mix. It looks like it’s going to be a Fatal 4-Way for the RAW Women’s Championship at No Mercy, and I have absolutely nothing to complain about. Emma was a surprise addition and I’m hoping for a surprise win at the PPV, too, just to spice things up in the division. Sasha Banks vs. Alexa Bliss, and Nia Jax somewhere in the picture is getting a bit stale. Jeff Hardy was given the Intercontinental Championship match he earned from last week’s Battle Royal. He lost due to some interference by Maryse, so I’m sure this feud isn’t over. I just wished they had the match at No Mercy instead, and used this time to build up some storyline to hype it up. Championship matches are okay to have on a weekly, free-TV show like RAW, but the match really couldn’t wait? I mean, Jeff Hardy winning the #1 Contendership was random enough—it would’ve been nice to create some angle with it. I swear, the WWE pays their writers way too much sometimes for coming up with absolutely nothing. This week’s RAW made me yawn and made me want to skip a lot of parts. It had its moments, but nothing as buzzworthy as last week’s episode. There was a nice advancement to the women’s storyline, but that’s pretty much it. Everything else was rather predictable, so I grade it a C-! You know, I think I’m the only person on this planet who thinks Enzo Amore isn’t a bad fit in the Cruiserweight division. He brings so much comedy and life into it, which—c’mon, admit it—the others aren’t really able to do as well as he does. Emma has a new theme! Again. But it’s much better than the last. You’d think that a billion-dollar company’s music department would take at least 5 minutes to review a theme before they just throw it out there for the thousands of people to hear.